Whether it’s a simple room makeover or big-time overhaul, it’s important to start with a plan. An electrical misstep, in planning or executing, could turn your project into a nightmare. Here, the Electrical Safety Authority shares four tips to help realize the reno of your dreams. Know who to hire for the job. Hiring skilled, qualified tradespeople will help achieve a reno that suits your needs and meets safety standards. When building your team, request written estimates from at least three contractors and check at least three references from people who’ve had similar work done. Find a licensed electrical contractor. Whether you’re hiring subcontractors on your own or relying on a general contractor, one of the safest and most cost-effective decisions you can make is hiring the right person for the electrical work. By law, if you’re hiring someone to do electrical work in Ontario they must be a licensed electrical contractor. They will help handle all the details when it comes to electrical work, permits and inspections to make sure your project is safe. Start with a plan. What’s behind your walls is just as important as what you put on them, so make electrical considerations a priority. Developing a plan early that incorporates all electrical components, including lighting and outlet placement, can help to avoid costly changes once the project is complete. Apply for permits. 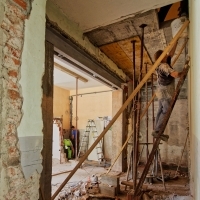 Depending on the scope of your renovation, building permits may be required – but an ESA electrical permit is always needed. Whether you’re hiring a licensed professional for the job or doing it yourself, getting permits ensures your home is protected by your insurance.